While researching our Hawaii trip, I discovered malasadas. A malasada is a Portuguese doughnut, in my mind, the Portuguese version of a Polish paczki: balls of yeast dough deep-fried in oil and coated with granulated sugar. Traditional malasadas contain neither holes nor fillings, but some are filled. They are eaten especially on Mardi Gras - the day before Ash Wednesday, but are available year round in HI. Of course I had to try malasadas. Our fist stop: Leonard's Bakery on Oahu. We got there just as a fresh, hot batch was finishing. There were a lot of people there, buying malasadas and then standing outside, eating freshly made doughnuts. We got 4 filled malasadas: dobash (chocolate), custard, haupia (coconut) and a special (I think it was mango). We didn't attack the hot doughnuts in the car, nor as soon as we got back to the hotel because we had to rush to freshen up and get to our dinner reservation. After dinner, back in the hotel room, I ate the chocolate one. Honestly, I wasn't impressed. Maybe because I was so full from dinner and I felt obligated to eat one of the malasadas we bought on the day we bought it. Mostly, I wasn't a fan of the dobash flavor. The next morning I ate the custard one and it was so darn good. I scarfed it up and then moved on to the special one despite SP's disapproving look and comment about too much doughnut for breakfast. Whatever, it was vacation! All the goodies at Leonard's. Our next malasadas were from Tex Drive-In in Honoka'a on the Big Island. While they made some fresh, hot malasadas, we shared a grilled cheese and tomato sandwich because we were hungry. Then our doughnuts were ready: Bavarian, chocolate, mango, apple. I ate the Bavarian right away. Oh. My. Gosh. 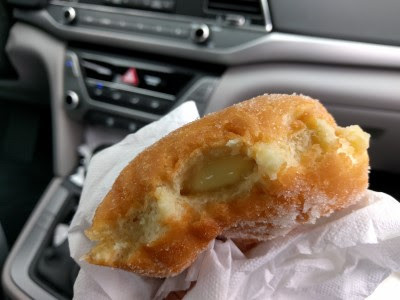 Yes, I had sugar all over my face, my shirt, the car, but it was so worth it for this hot malasada. I wished I had eaten a Leonard's malasada while still hot just for comparison. I'm not sure which malasadas were tastier. Thankfully, they're on different islands so you don't have to choose, location chooses for you. Are they tastier than my beloved paczki? Thankfully, I don't need to decide because malasada = Hawaii and paczki = Pittsburgh. Location determines my doughnut. Both are sugar coated, custard filled, pillowy, fried dough delights. We definitely suggest trying malasadas from these places if you're in Hawaii.